Our performance monitoring service means our team will look at how your website is performing and how we can improve it. One of the things our clients love to know is ‘how many visitors are visiting my website?’ You will be able to access your Google Analytics on your dashboard and we will send a weekly report with all your data so you can see the amount of traffic coming into your website. How your website keywords are performing in the search engines is very important to your business. 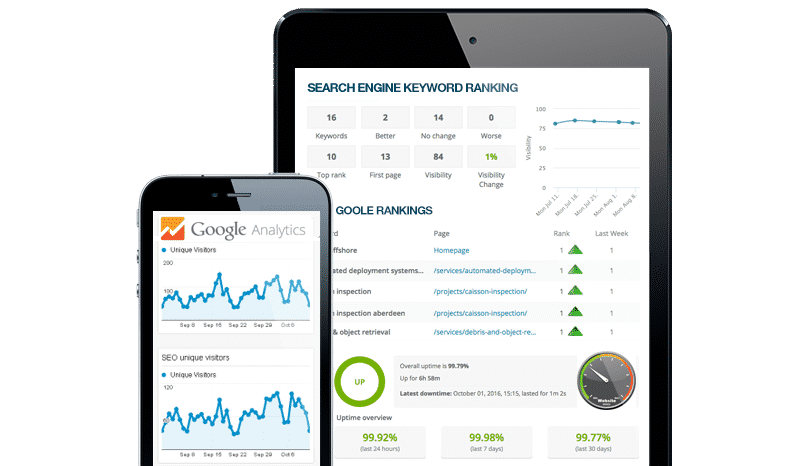 We keep track on how your keywords are ranking in Google and other search engines, find out who your competitors are and how you compare against them. If your website is slow it can hurt your business a lot. That is why we review your website performance regularly and optimise to ensure your it is performing at its peak at all times. We also ensure your plugins and code is always on the latest fastest versions. We clean up spam comments and optimise your database regularly to speed up your website. As your database grows it can slow down your website performance so we keep everything clean and optimised. New devices come onto the market every week with new screen sizes likes the new Iphone 7, mini iPad, Galaxy S7, so we ensure that your website is always up to date and ensure your website looks and works great on all new devices. Our website care team send you a Google Analytic report every week so you can see how much traffic is coming into your website. We will also send you your keyword rankings so you can see how your keywords are ranking in the search engines. The report also includes your website performance and optimisation results. NEED US TO MONITOR AND IMPROVE YOUR PERFORMANCE?